I tend to be the planner and executor when it comes to, well...everything. Holiday parties, baby showers, game nights, double-date dinners, volunteer events, best friends’ birthday parties, family vacations, camping trips, babysitting, and even the redecorating of my mother’s house—I love being busy. More importantly, I live to participate, to be involved, and to help. My friends and family love to use me for my organizing and planning skills, and I love being of use. Spending time with loved ones and being part of a community is what life is all about. But it does mean that I often find myself juggling multiple projects and running late. If you are a busy, on-the-go person like me, then you know that communication and time management is key to making it all work. That’s why I love discovering and playing with new technology and apps that help me stay connected and organized. Task manager apps, regular Amazon and grocery deliveries, smart-home assistants—if it means I can maximize my time and live my best life, then count me in. In terms of smart-home technology, the thing I am most excited about right now is Intercom Anywhere. It’s an app that pairs with a Control4 Smart Home system to let you monitor and communicate with your whole home, even if you aren’t home. Always home and always in control. We regularly host game nights with our good friends and family dinners with our parents and siblings. Sometimes my husband and I get stuck at work or we have to make a last-minute run for a missing ingredients and beverages. With Intercom Anywhere by Control4, we can see when guests arrive at the front door and we can communicate with them. Sure, any video doorbell could do this, but with this app we can customize and preset buttons that control our smart home and use them while we’re on the video call with the front door. This means we could arm/disarm the alarm system, unlock the door, and turn on entry lights for trusted guests with just the tap of a button. It really is a wonderful tool, because nothing makes me feel worse than knowing my guests had to wait outside or in the car for 15 minutes because I had to make a quick run to the store—even if I am cooking them dinner. It’s also tremendously helpful when deliveries arrive. I’m rarely home when packages or grocery deliveries come in. I don’t like the idea of my newly purchased goods stilling out on the porch, nor do I like the idea of having to stop by an Amazon locker to pick up by order (have I mentioned I’m busy?). With this awesome Intercom Anywhere app, I can see the deliverer, make sure security cameras are on, let them in, watch them put the package just inside the door, and then lock the door and arm the alarm again when they leave. It’s great when scheduling maintenance and service visits too, because—seriously—no one has time to wait for someone who might show up sometime between 10 a.m. and 4 p.m.
My husband keeps his phone on vibrate at all times and it drives me nuts. This brings me to another cool function of Intercom Anywhere. 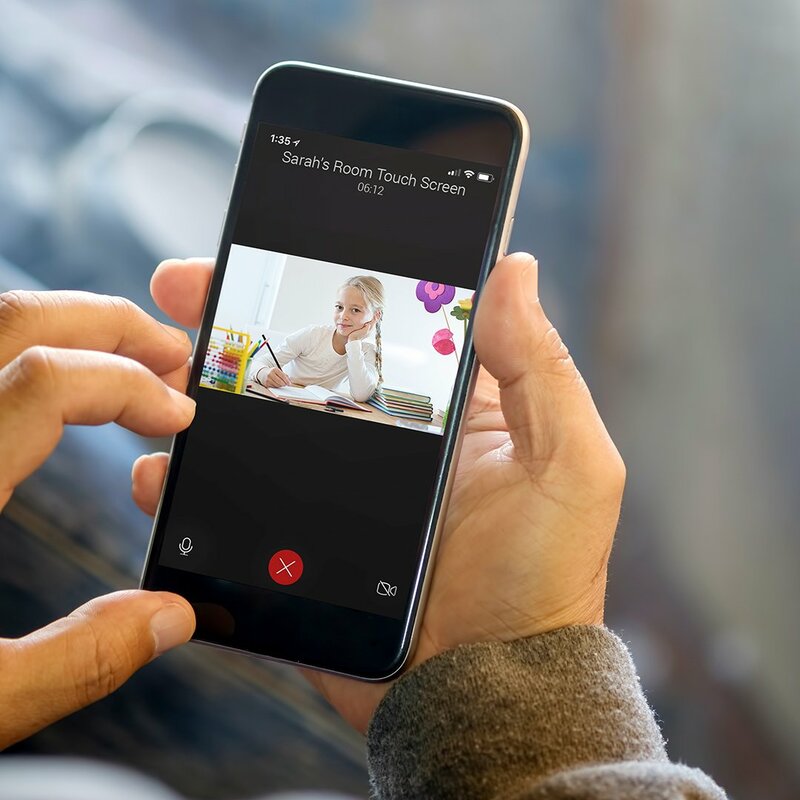 With this system, I can automatically connect to any in-wall touch screen in the house from my smartphone or another touch screen to see if he’s home and use the video chat feature to call out to him. You could also use this function to check on pets and kids while you’re out or simply too busy to drop what you’re doing and run upstairs. I imagine it would be particularly helpful to monitor kids who are supposed to be doing homework while parents are doing chores or cooking dinner. If auto-answer is something you or your family is not comfortable with, you can always turn off the feature and it will ring touch screens so that calls will need to be answered. It also works both ways, so any touch screen in the house can also be used to call out to connected mobile phones. Live your best life with smart-home technology. It’s truly integrated and really smart technology like this that gets me excited about the future. We work to live, some people live to work, but I don’t know anyone who lives to stress. 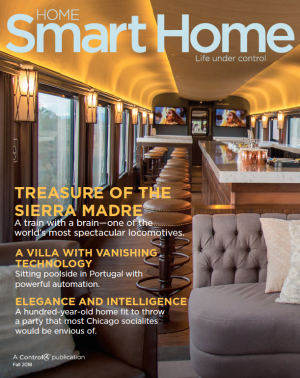 Smart-home systems like those made by Control4 are changing the way people live for the better by providing automation solutions and Internet of Things (IoT) tools that bring us comfort, convenience, and peace of mind so we can spend more time and energy doing the things we love. Experience the magic and #C4Yourself.